This SEN policy was coordinated by the learning support team in consultation with the principal. This policy will be reviewed and amended as necessary as part of our School Self Evaluation (SSE). This policy was circulated to staff in April 2018 and made available on our website in April 2018. 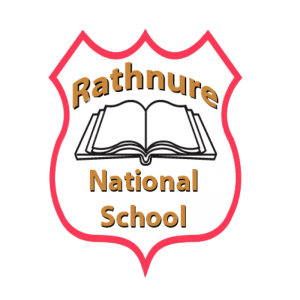 Rathnure N.S. is a Roman Catholic co-educational primary school of the parish of Rathnure, under the Patronage of the Bishop of Ferns. The school has a catholic ethos and we commit ourselves to making our school a safe and enjoyable place of education through an integrated and challenging curriculum. Each pupil will be respected and encouraged to develop to his/her potential and to grow in love and respect for God, for self, for others and for our environment. We are open to the challenge of the future, encouraging effective co-operation between pupils, staff, parents, management and the local community. Molfaimid go h-árd úsáid na Gaeilge sa scoil. provide practical guidance to staff, parents and other interested parties about our SEN procedures and practices. outline the framework for addressing additional needs in our school. fulfil DES circular 0013/17 -Circular to the Management Authorities of all Mainstream Primary Schools; Special Education Teaching Allocation, and new 2017 Guidelines for Primary Schools: Supporting Pupils with Special Educational Needs in Mainstream Schools). Our school is dedicated to the implementation of an effective system for meeting the needs of all our pupils in accordance with our mission statement, the resources provided by the DES and the Board of Management. We believe that all our children have a right to an education, which is appropriate to their individual needs. We strive to ensure that all our children feel that they are a valued part of our school community. We are fully committed to the principle of inclusion. This policy aims to enable children with Special Education Needs (SEN) and children whose first language is not English, to become fully integrated members of our school community. This will be achieved by careful consideration of the needs of each child and by either modifying the environment, activities or by providing support that will help the child to participate in them. The BOM oversees the development, implementation and review of school policy on SEN. They also ensure that adequate classroom accommodation, secure storage space and effective teaching resources are provided. Implement and monitor the school’s Additional Needs policy on an on-going basis. meet at the beginning of the school year with class teachers, relevant staff and parents to review SSFs. The duties of the SNA carried out according to the guidelines for Special Needs Assistants from the Department of Education and Skills and under the direction of the principal/class teachers, the SNA will meet the care needs of the SEN pupils to which they have been assigned. (Circular 10/76). Collaboration and sharing of relevant information between home and school are essential elements of our SEN policy. Parents/Guardians through their unique knowledge of their own children have much to contribute to their child’s learning. We use the Continuum of Support Framework set out by the Department of Education to identify and support children with additional needs. 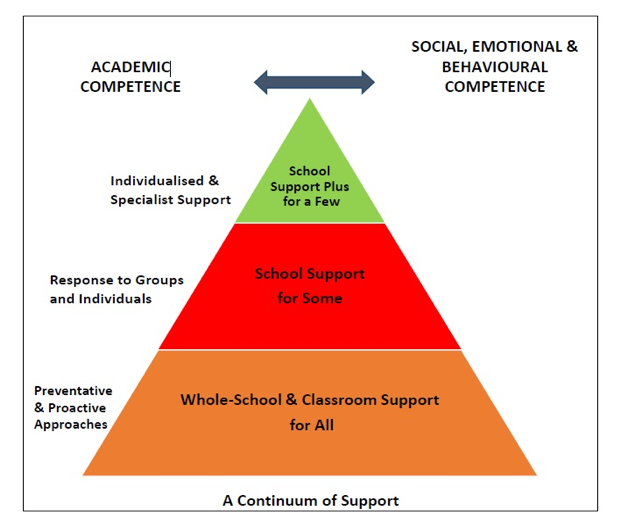 Like this framework, we recognise that special educational needs occur along a continuum, ranging from mild to severe, and from transient to long-term and that pupils require different levels of support depending on their identified additional needs. 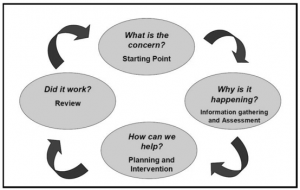 By using this framework, it helps us implement a staged approach to ensure that our support and interventions are incremental, moving from class-based interventions to more intensive and individualised support, and are informed by careful monitoring of progress. The Continuum of Support is a problem-solving model of assessment and intervention that enables us to gather and analyse data, as well as to plan and review the progress of individual pupils. Identification of educational needs is central to our policy and the new allocation model. 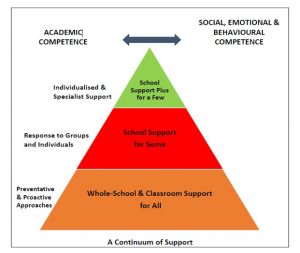 By using the Continuum of Support framework, we can identify pupils’ educational needs, to include academic, social and emotional needs, as well as needs associated with physical, ­­­­sensory, language and communication difficulties. This, in turn, allows us to identify and respond to needs in a flexible way. Classroom Support is the most common, and typically the first response to emerging needs. It is a response for pupils who have distinct or individual educational needs and who require approaches to learning and/or behaviour which are additional to or different from those required by other pupils in their class. Problem-solving at this level typically begins when a parent or teacher has concerns about an individual pupil. The teacher and parents discuss the nature of the problem and consider strategies which may be effective. Classroom Support incorporates the simple, informal problem-solving approaches commonly used by class teachers to support emerging needs. In some cases, interventions at classroom support level are not enough to fully meet the pupil’s special educational needs. School Support may, therefore, be required. The class teacher needs to involve the Special Education Teacher Team (SEN Team) in the problem-solving process at this point and it involves more systematic gathering of information and the development and monitoring of a School Support Plan. If a pupil’s special educational needs are severe and/or persistent, they are likely to need intensive support. School Support Plus will generally involve personnel outside the school team in the problem solving, assessment and intervention process. However, the information from Classroom and School Support work will provide the starting point for problem-solving at this level. Classroom support and school support will continue to be an important element of his/her individual education plan. Assessment is part of what a class teacher does on a daily basis for all children. Some methods include self-assessment, questioning, teacher observation, portfolios of work and teacher-designed tasks and tests. The information gathered enables the teacher to plan learning experiences based on the appropriate objectives from the curriculum. 1st class-6th Class: Observation, Checklists, Drumcondra Reading, Sigma T.
As a school, we also carry out a range of other assessments when necessary. We continually review the assessment and screening tests that we use in order to balance the needs of our pupils and the need to provide information for appropriate support. Therefore we may deviate from the above list prior to the review date. The development of agreed approaches to the teaching of Literacy and Numeracy in order to ensure progression and continuity from class to class. Provision of additional support in language development and any relevant early literacy and mathematical skills to pupils who need it. Ongoing structured observation and assessment of the language, literacy and numeracy skills of pupils in the infant classes to facilitate early identification of possible learning difficulties. Close collaboration and consultation between the Infant Teacher and the SET team. Parental involvement in promoting literacy and numeracy e.g. Maths for Fun, Homework Policy Guidelines for Parents, Literacy Lift Off. Differentiation – adapting the learning environment. Once pupils needs have been identified, Special Education Teachers (SETs) are deployed to address these needs as required. We deploy SETs in a variety of ways in order to effectively meet pupils’ needs. We aim to strike a balance between in-class support, group and individual support while ensuring that the needs of children with additional needs are met inclusively. Importantly, the level and type of support reflect the specific targets of individual pupils as set out in their support plans and are informed by careful monitoring and review of progress. In this way, following a period of intervention, some pupils may no longer require additional teaching supports; some may require the same level, while others may require more intensive supports. In planning the allocation of additional teaching supports, the over-riding principle is that resources are deployed to address the identified needs of pupils. Importantly, those with the highest level of need should have access to the greatest level of support. We consider methodologies best suited to promoting meaningful inclusion such as differentiation, heterogeneous grouping, team-teaching and small group teaching. In addition to literacy and numeracy difficulties, many pupils will have specific needs in such areas as oral language, social interaction, behaviour, emotional development, motor skills and application to learning. At the end of each term the SET team meet class teachers and SNAs and review children’s needs, the resources in place and progress made using the Continuum of Support problem-solving model of assessment and stage approach flow charts. As a SET team, we review all support and allocate resources for the subsequent term. We cross-reference the needs of pupils at School Support and School Support Plus levels and consider common needs that can be met by grouping, to ensure effective and efficient teaching and learning approaches. if a pupil is unavailable for their supplementary session due to special circumstances, the Special Education Teacher will attempt to reschedule the session with the co-operation of another teacher. interruptions to classes/classrooms/SEN timetable should be kept to a minimum. Provision for pupils with special educational needs is enhanced through clear identification processes and careful planning of interventions to address academic and/or personal and social development needs. Identification of needs, planning, target-setting and monitoring of outcomes are essential elements of an integrated and collaborative problem-solving process. A class teacher or SET should open a Student Support File once a child is placed on Stage 1 –Classroom Support on the continuum. This is stored digitally on the Aladdin Records and a paper copy is stored in the class teacher’s assessment folder and SEN filing cabinet stored in the secretary’s office. We use three different support plans for the three stages of support on the Continuum of Support. A Support Plan at stage 1 is a simple plan which is drawn up by the Class Teacher in collaboration with the SET which outlines the pupil’s additional educational needs and the actions, including individualised teaching and management approaches, which will be taken to meet the pupil’s needs. The plan may also include home-based actions to be taken by the pupil’s parents to support their child’s development. The Classroom Support Plan should include a review date. This could be at the end of a school term. A Support Plan at stage 2 is a plan drawn up by the class teacher and appointed SET teacher. It will set out the nature of the pupil’s learning difficulties, define specific teaching, learning and behavioural targets and set a timescale for review. The plan should, for the most part, be implemented within the normal classroom setting and complimented by focused school based intervention programmes. Depending on the nature of the needs and on the school context, additional teaching might be within a small group or individual or a combination of both either in class or on a withdrawal basis. Home-based actions may also be included. After the plan has been drawn up, it should become a working document through the careful monitoring of the pupil’s response to the actions taken. SSF meetings are coordinated by a member of the SEN team. This is usually one of the child’s Special Education Teachers. Parents will be kept informed of developments. At the beginning of each term planning meetings between class teachers and SETs will take place. The regular SEN timetable will not be followed during these weeks. This flexibility ensures adequate cover for class teachers and also facilitates regular SET team planning meetings with the principal. Every staff member and pupil is entitled to a safe, secure environment and to be treated with due respect. All appropriate measures are taken to ensure the safety of each pupil with SEN. When a place is offered to a child with SEN, every effort will be made to ensure that the supports to which the child is entitled are in place as soon as possible. Staff members will be informed of any potential risks and, where necessary, individual plans will be drawn up and implemented. Where pupils receive support on a one-to-one basis, the SET teacher is responsible for ensuring that both themselves and the pupil are visible through the glass panel in the door. Where the there is no glass panel, the door of the room should remain open. Where pupils are withdrawn for support, the SEN teacher should collect and return children to their classrooms. Where a child has access to an SNA, they may withdraw the child from the class if a plan is in place with the class teacher. This policy will be implemented from April 2018. It will be reviewed in June 2019 by the Special Education Team and all staff at Rathnure NS, pending a proposed review of the New SEN Allocation Model by the Department of Education and Science in 2019.